Creating your own Jewish legacy ensures your passions and the Jewish values you cherish will continue beyond your lifetime. Learn how The Life & Legacy program makes it easy and affordable to preserve and strengthen programs and organizations YOU care about that support Jewish life today and for generations to come – and potentially enjoy tax benefits. It’s easy to create your own personal legacy. Start by signing a simple letter of intent, a non-binding promise to leave a gift in the future to the organization(s) of your choice. With a legacy gift you can still take care of your family while also leaving something to preserve the programs and organizations that you care about. Most legacy gifts are simple designations in a will, retirement account or life insurance policy. Consult your financial adviser regarding these or other planned gifts. Legacy gifts have increasingly become part of future planning when individuals and families meet with their financial, insurance and legal advisers. The Jewish Federation and participating organizations in The Life & Legacy program can help facilitate your philanthropic planning by offering access to investment options such as gift annuities and donor advised funds. Let organizations know if you have already worked with a financial adviser to include supporting them in your plans. If you designate one of the Life & Legacy participating organizations, they may earn an additional financial incentive. The following Jewish institutions are partners with the Jewish Federation in the Life & Legacy program. While legacy commitments can be made to any Jewish organization through the program, these partners and the Federation receive direct support and financial incentives benefitting the entire Jewish community from The Harold Grinspoon Foundation when milestonse are reached. The following articles provide additional context about legacy giving. How legacy giving is transforming Jewish communities across North America. Life insurance is one of the many ways to make a legacy gift. Amelia Marks was a person of modest means whose legacy made a big impact. 1. What is a legacy gift? It is a gift of an asset after you pass away. 2. Who should sign up? Everyone. This is not just for the wealthy or the seniors. There is no minimum gift required, and no expectation of payment while you are living. 3. Why wouldn’t I leave all of my estate to my children? Legacy gifts are usually only a percentage of your estate and demonstrate to your heirs your commitment to Jewish values. 4. Does the gift have to be money or can other things be given? Legacy gifts can take many forms: stocks, bonds, real estate, retirement assets, cash, life insurance proceeds, etc. 5. How much should I bequeath? There is no correct amount – it varies from person to person – and must be what is right for you. Any amount is appreciated. Some people will choose to give a set dollar amount, some will specify a percentage of their estate, or all or part of a particular asset. 6. Can I change my gift later? Yes - if your circumstances change you can adjust the amount of your gift. 7. What are the ways I can leave a legacy gift? There are many ways, including making a bequest in a will or trust; naming the organization of your choice as a beneficiary of a life insurance policy, IRA, or pension fund; giving a gift of cash or assets; setting up a charitable gift annuity or charitable remainder trust. Please consult your professional advisor to determine which method of giving is best for you. 8. Why is it important to leave a legacy gift? The long-term future of the Jewish community requires adequate financial resources. Recent studies show organizations need to generate 20%-25% of their operating budget from endowed funds in 20 years in order to meet their obligations. By leaving a legacy gift, you help ensure that the values and services of Jewish organizations you care about will be part of our community long into the future. 9. I live paycheck to paycheck and I don’t have any money to give now. Can I still participate? The advantage of legacy giving is that no money is paid now. The gift is paid after your passing, from what is left in your estate. 10. How can I give without spending money on a will or trust? One option is to name the organization of your choice as a beneficiary of an account you already have. You might also consider a life insurance policy, with that organization as a beneficiary. 11. Where does the money go? Please discuss your wishes with your designated organization of choice. If someone leaves money for a specific purpose, the organization should honor those wishes. 12. 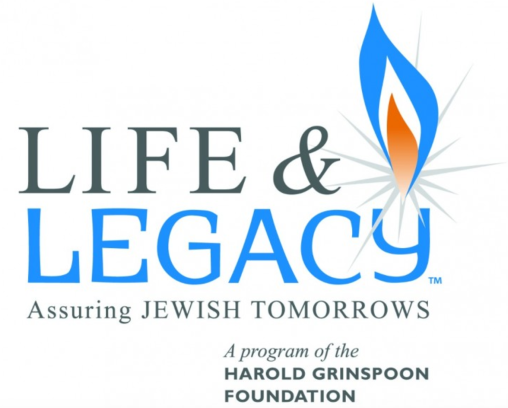 What is the Harold Grinspoon Foundation’s LIFE & LEGACY program? Established in 1993, the Harold Grinspoon Foundation is a philanthropic organization deeply committed to charitable giving, primarily in the Jewish world. LIFE & LEGACY is a 4-year partnership program of the Harold Grinspoon Foundation that assists communities across North America, through partnerships with Jewish Federations and Foundations, to promote after-lifetime giving to benefit Jewish day schools, synagogues, social service organizations and other Jewish entities. Through training, support, and monetary incentives, LIFE & LEGACY motivates Jewish organizations to secure legacy gifts, steward donors and integrate legacy giving into the philanthropic culture of the Jewish community. 13. How does The Jewish Federation in the Heart of New Jersey get money from the Endowment Fund? Based on current policy, the Federation will annually receive 4% of the prior 3-years’ average balance of its endowment fund. The distribution is available for use at the Federation board’s discretion. The board could opt to not take a distribution in any year and thus allow the endowment to grow further. 14. Who invests the money in the Endowment Fund? The Jewish Community Foundation manages our endowment fund, along with many others in the community. They have been doing so for many years and have an excellent performance record. 15. What rate of return does the fund average annually? Average returns have been 4-5% annually. 16. How do I sign up? The first step is to fill out a Letter of Intent. For questions, contact us by email or call 732-588-1800.